The nonprofit Soup Kitchen was established in 1980 with a specific goal of helping the less fortunate members of the community. These included the elderly, unemployed, underemployed, poor and the homeless. The church provides a safe, clean and uplifting environment for guests in need of a nutritious lunch at no cost, seven days a week. It is sustained by committed and compassionate volunteers and by the generous contributions of donors. The Thanksgiving dinner is a meal with a large roasted turkey at the center of the table. It is served with traditional dishes such as mashed potatoes, stuffing and cranberry sauce. The ‘First Thanksgiving Feast’ in 1621 between the Pilgrims and the Wampanoag Indians at Plymouth Colony included waterfowl, venison, ham, lobster, clams, berries, fruit, pumpkin and squash. “I am no longer working, so I have time to give back to my community and for lunch today I am preparing the desserts,” Volunteer Paula said. 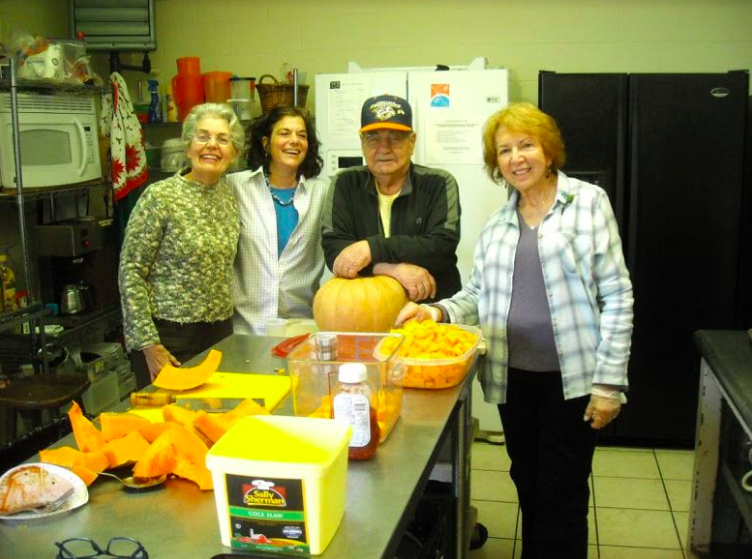 “It is fun to help out in the kitchen and today I am preparing a bean salad,” Volunteer Theresa said. “I want to give back to my community and basically I help serve and do the cleanup,” Volunteer Tricia said. Malnourished pregnant women are more likely to have low birth-weight babies. Inadequately nourished infants and children are suitable to have learning problems and more illnesses. Adults who are hungry are less energetic and productive, making it difficult to find a job or care for children. Malnourished elderly persons are less able to prevent illness and enjoy good health. According to the United States Department of Agriculture (USDA), the food pyramid is designed to make healthy eating easier. Healthy eating is about getting the correct amount of nutrients-protein, fat, carbohydrates, vitamins and minerals a person needs to maintain good health. Healthy eating involves plenty of vegetables, salad and fruit; a serving of whole-grain cereals and breads, potatoes, pasta and rice at every meal; some milk, yogurt and cheese; some meat, poultry, fish eggs, beans and nuts; a very small amount of fats, spreads and oils plus a very small amount of drinks high in fat, sugar and salt. For additional information, visit www.christchurchsuffern.org or call 845-357-1615.